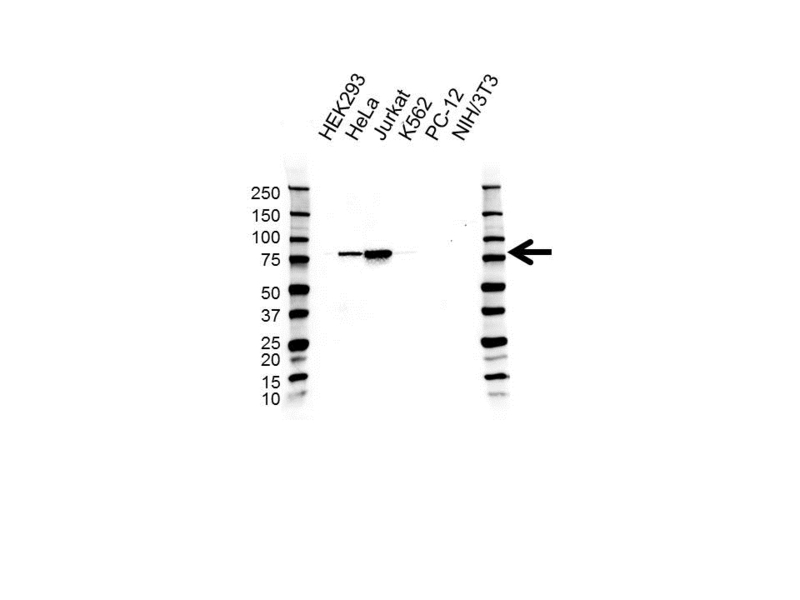 Western blot analysis of whole cell lysates probed with diacylglycerol kinase alpha antibody (VMA00496) followed by detection with Goat anti Mouse HRP conjugated (STAR207P) and visualized on the ChemiDoc™ MP with 68 second exposure. Arrow points to diacylglycerol kinase alpha (molecular weight 83 kDa). Mouse anti-human diacylglycerol kinase alpha antibody recognizes diacylglycerol kinase alpha, also known as 80 kDa diacylglycerol kinase or DAG kinase alpha. This antibody has been extensively validated for western blotting using whole cell lysates. Mouse anti Human diacylglycerol kinase alpha antibody recognizes diacylglycerol kinase alpha (DGKA), also known as 80 kDa diacylglycerol kinase or DAG kinase alpha. The protein encoded by DGKA belongs to the eukaryotic diacylglycerol kinase family. It acts as a modulator that competes with protein kinase C for the second messenger diacylglycerol in intracellular signaling pathways. It also plays an important role in the resynthesis of phosphatidylinositols and phosphorylating diacylglycerol to phosphatidic acid. Alternative splicing occurs at this locus and four transcript variants encoding the same protein have been identified. (provided by RefSeq, Jul 2008). Mouse anti Human diacylglycerol kinase alpha antibody detects a band of 83 kDa. The antibody has been extensively validated for western blotting using whole cell lysates.